It was getting to be that time of year again. The weather was warming up, spring was coming to a close and all I could tell people was that I had commitments for the last 2 weeks of June. Some people would ask me to go camp, or fish on other lakes but the last 2 weeks of June I always save for Lake Almanor’s famous hex hatch. If you’ve ever hooked into one of the monster Browns or Rainbows there you’ll understand. In the past I would head off after a quick early dinner. I would leave the girls with mom and go off to the lake until well after dark. This year I had an extra special treat to look forward to. My girls were old enough to join me this time and we were all looking forward to this adventure. In the past they would usually end up tending the camp fire until I got back or take a short nap until they heard dad pull up into the campsite. After all the years of curiosity, “what does he do out there until dark?” they were rewarded to have a chance in participating. It really is a family tradition because we try and make it every year. 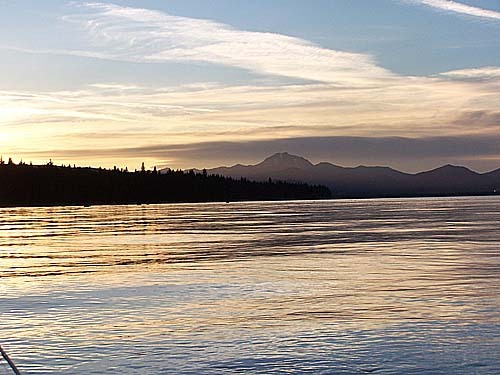 We still camp at Almanor West and usually spend the day at one of the lakes many beaches. You can still drive up to many of these and start the picnic right from the car. I helped the girls get in their waders, float tubes and all the other gear they needed. They were so excited just to be floating into the unknown. I was their guide and I was having just as much if not more fun than they were. the splash of rising trout the comradery of all the float tubers around us and best of all we had a great dialog as we were fishing that I will always treasure. Oh, did I mention we also had 2 long distance releases this time. 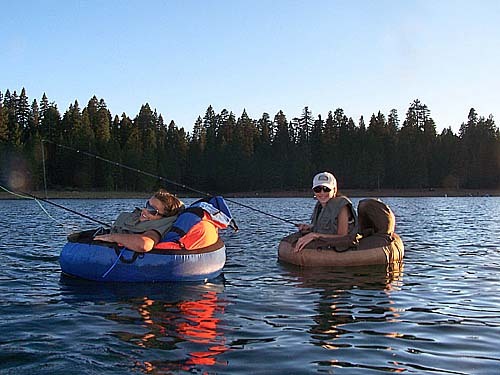 One was my oldest daughter’s first Lake Almanor fish, a good sized fish at that but just on for a short while. She had been anticipating a strike for a long time, ever since she saw a fellow float tuber pull one of these monsters out. I had a good sized one on that took me for a ride. It took a couple of good runs and on it’s way back in got tangled between my daughter and me and released itself. My daughters were so excited watching me play this fish out on the water. I need to dedicate this trip and many of the others to my wonderful wife Patty. Without her support it would be virtually impossible to have the girl’s fish with me on these early excursions. She does much of the work we all take for granted sometimes. Some of it is words of encouragement but a lot of it is pitching in on these camping trips, helping with all the things that make a trip successful. Things like pitching tents, food prep, camp equipment and the list goes on and on but most of all she is just there for us whenever we need her.